The Latin language developed as one of the dialects of the Italian Peninsula, in the area around Rome, in pre-Classical times. The other “Italic” dialects died out, but some influence on pronunciation remained, for instance, in the northwest region, Gallia Cisalpina, where the substratum was Celtic, as in transalpine Gaul. Regional dialects of Italian have long persisted in educated speech, and there was and is local differentiation in the speech in the important musical cities. Apart from the alternatives of Florentine and local models, Latin in the important musical cities may have been influenced by the presence, from the thirteenth to the mid-sixteenth centuries, of French and Flemish singers and directors, who had great prestige. Scholastic Latin, deriving from Charlemagne’s initiative throughout western Europe in the early ninth century, may have survived in pockets in Lombardy, and there is a belief that there has been continuity in Italy since that time; possibly the earlier tradition found its way to the early universities (Bologna was founded in 1088). There had, however, been changes in Latin pronunciation since the Classical period, as in the vernacular dialects and languages. In the early centuries a major change began in the sound of c and g before the front vowels e and i. The classical [k] and [g] (used in the “Restored Classical” school Latin), which are stops produced on the soft palate, moved forward to the hard palate and beyond, and came to be sounded in the ranges of [kj], [tj], [t∫], [ts], [s], and [gj], [di], [dʒ], and [ʒ] respectively. The exact quality of the sound relevant to Latin (and to the vernacular) depended on the time and place. There were considerable differences in the sounds of these stops between countries and (some­times) centuries. The sounds detailed below are based on the phonetic equivalents of those described in Liber Usualis, xxxvi—xxxix, with a few variants for those who wish to be more adventur­ous. * In departing from the standard version decisions are needed on the nature of the palatalization of ce, ci, ge, gi; and on the production of the vowels e and o.
Liber Usualis and Italian literary Latin always open e and o. Standard Italian and some of the dialects, like classical Latin and most Romance languages, make these two vowels closed or open according to their place in the word. 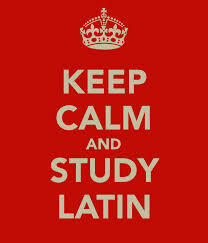 The texts with which we are concerned are in medieval Latin, which was (except in France) a stressed language. The placing of the stress broadly followed the Classical rules. To assign stress one has to know whether a syllable is “long” or “short” A syllable was “long” if it ended with a long vowel, or with two consonants (or with x), or with a single consonant when the following syllable began with a consonant. The stress accent in a word of two syllables fell on the first (‘De-us ‘pa-ter); in longer words it fell on the penultimate syllable if it was long/heavy (lau-‘da-mus, ce-‘le-stis, vo-‘bi-scum, om-ni-po-‘ten-tem): Otherwise on the antepenultimate (‘Do-mi-nus, vi-si-‘bi-li-um). In words of four or more syllables there tends to be a secondary stress (here marked) which des from the natural tendency to alternate stressed and unstressed syllables: om-‘ni-po-‘ten-tem. Some longer words follow a different pattern, which is usually clear from the musical setting: om-‘ni-pò-tens has the primary stress on its second syllable despite its long vowel. The phonetic texts below show the primary stresses (following the mark ). This list contains only consonants that are pronounced differently from English; but some, like d, l, and t, are produced with less explosion and further forward than in English. Alternatives to the standard “Roman Style” are suggested in parentheses. gn: [ŋ], prolonged in Tuscany and central and southern Italy. h: Always silent in present use, but between vowels (mihi, nihil) it was often sounded (Liber usualis gives [k], but [ç] may have been used in some cities). i, j consonantal : [j], but in early centuries of our period probably [dʒ]. qu, ngu: [kw], [ngw] (probably following the style of u in the northwest: see “Vowels,” below). r: Slightly rolled [r̥] notably when before another consonant (carnis, parce, parte). s : [s], but between two vowels it is “slightly softened” (often not at the end of a word). The general vernacular habit tends toward a voiced sound, [z], in the north but retains [s] in the center and south. Compounds have [-s-}: desuper, praesepio; also (in modern use) eleison. x : [ks] but tending toward [gz] between vowels (exercitus). xc: [ksk] before a, o, or a consonant. [k∫] before e or i (excelsis): or [kst∫] or [kt∫]. Double consonants are sounded twice, but not rigorously so; ecce is given in Liber usualis as “et-che”; i.e., with [t-t∫]. However, awkward groups have probably often been simpli­fied, especially in vernacular Latin, for instance sanctus may have had [nt] or [ɲt]. o: [ɔ] (but regionally [o] in some words: see e above). Again no diphthongs. y: [i] rather than the Classical [y]. * The Liber Usualis is a twentieth-century hybrid and cannot be considered a good guide to regional influences in pronunciation. M. Bonioli. La pronuncia del Latino nelle scuole Turin, 1962. H. Copeman. Singing in Latin. Oxford, 1990; revised as paperback 1992. Pp. 171-75, 272-75. M. Cortellazzo. I dialetti e la dialettologia in Italia. Tubingen, 1980. Enciclopedia Italiana Treccani, 1933. “Italia”, on linguistic history and dialects, pp. 922-25. A.L. and G. Lepschy. The Italian Language Today. London, 1977. Opening chapters. B.Migliorini and T. G. Griffith. The Italian Language London, 1966. G. Rohlfs, Grarnmatica storica della lingua Italiana e del suoi dialetti. Turin, 1966. Also in German as Historische Grammatik der Iialienische Sprach. Berne, 1949. V. U. G. Scherr. Auffuhrungspraxis Vokalmusik: Handbuch der lateinischen Aussprache. Barenreiter, 1991. Pp. 55-92. ⟵Morten Lauridsen: anima e carisma.